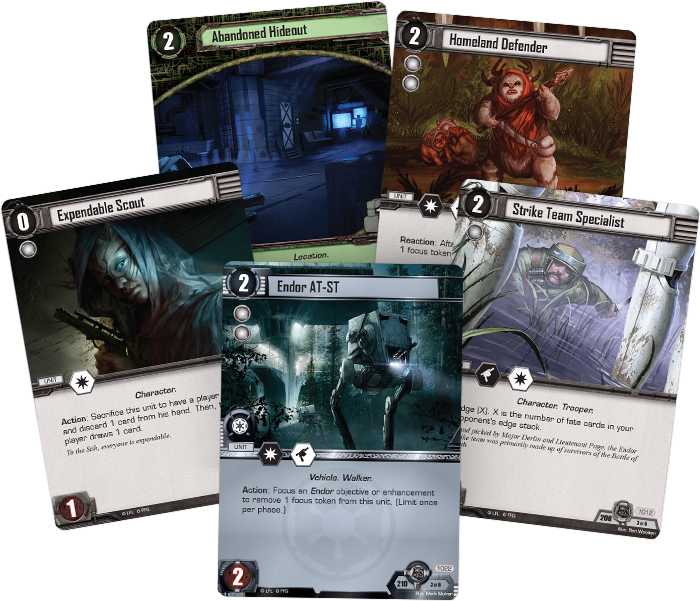 Fantasy Flight Games is proud to announce Press the Attack, the fifth Force Pack in the Endor cycle for Star Wars™: The Card Game! After meeting and forging their alliance with the Ewok tribes, the brave Rebel heroes prepare to lead their elite strike team in the final assault on the shield generator. If the Rebels succeed and accomplish their goal, the shield that protects the Death Star will fall, leaving it open to an interior assault by Rebel fighters. If the Rebels fail, however, the Death Star will be impregnable and its fully operational superlaser will combine with the Imperial fleet to inflict massive losses on the Rebel Alliance. 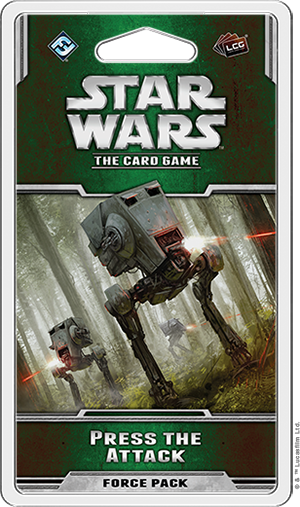 As part of the Endor cycle for Star Wars: The Card Game, Press the Attack invites you to experience the climactic events of Return of the Jedi as you reenact the movies or create your own stories. Within this Force Pack, you’ll find a renewed focus on Endor objectives as the Ewoks join the Rebellion’s efforts to infiltrate and sabotage the shield generator. You’ll also gain the aid of additional Ewoks with C-3PO or battle your foes as the dark side Force user, Maw. As the Battle of Endor intensifies, lead your forces forwards with Press the Attack. As a commander of the Imperial forces on Endor, you have been tasked with protecting the ground-based shield generator at any cost. Though you have a legion of the Empire’s best troops at your disposal, your task will not be easy. The Rebel assault will be determined, and they may have gained the help of the Forest Moon’s indigenous species. Fortunately, you have your own tools to use in the defense of your Endor objectives. The Imperial Navy objective set in Press the Attack begins with Protect the Generator (Press the Attack, 1020). 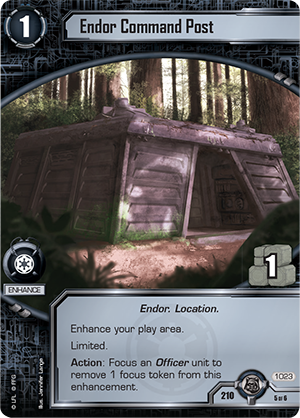 This is an Endor objective, making it useful for triggering other cards, but more importantly, it helps you ensure your opponent pays the price for attacking your objectives. 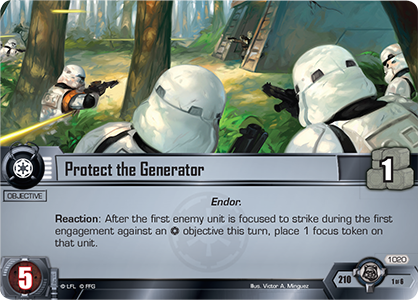 Protect the Generator reads, “Reaction: After the first enemy unit is focused to strike during the first engagement against an Imperial Navy objective this turn, place 1 focus token on that unit.” By adding additional focus tokens to the first unit to strike against an Imperial Navy objective, you may be able to reduce the light side’s effective attackers during their next turn. Even if your opponent plays around this effect, he may need to strike in a less-than-ideal order, making it easier for you to cut down enemy units with your own defenders. For the Imperial Navy, a significant part of your defense relies on a solid offensive. To that end, this objective set includes two copies of the Endor AT-ST (Press the Attack, 1022). 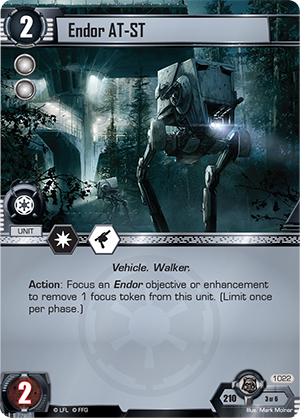 Although these units can defend, they’re best suited to attacking enemy objectives, and in addiiton, you can focus one of your Endor objectives or enhancements to remove a focus token from the Endor AT-ST, potentially letting them strike twice or more in a single engagement. 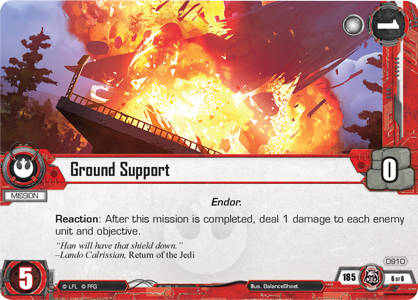 You may even be able to pay this cost with an Endor mission like Ground Support (Solo’s Command, 910) that your opponent has played as an objective under your control. Whether you’re defending your own objectives or taking the fight to your enemies, you can benefit from recruiting Colonel Dyer (Press the Attack, 1021). Colonel Dyer always boasts a normal tactics icon that he can use to neutralize an enemy unit, and he gains a unit damage for every Endor objective you control and a blast damage for every Endor objective your opponent controls. Ultimately, Colonel Dyer is determined to control Endor, whether that requires you to attack or defend. This objective set also introduces a new enhancement, the Endor Command Post (Press the Attack, 1023). 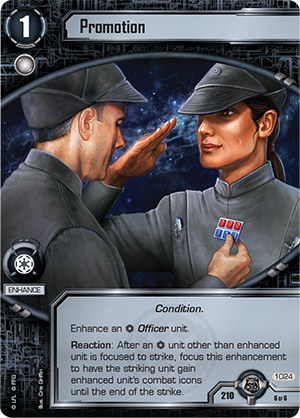 In most respects, this enhancement is fairly standard—it costs one resource, provides one Imperial Navy resource, and bears the limited keyword. However, it differs in one key aspect: you can take an Action and focus an Officer unit to remove a focus token from this enhancement. In some cases, this may allow you to play more units during the deployment phase, but perhaps one of the best ways to use the Endor Command Post is in conjunction with Grand Moff Tarkin (Imperial Entanglements, 872). 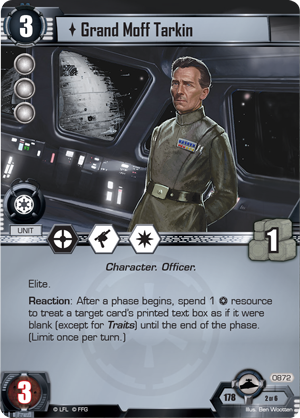 Blanking enemy cards repeatably with the Endor Command Post and Grand Moff Tarkin can be a powerful asset in your battle to defend the shield generator. Finally, the Protect the Generator objective set concludes with another new enhancement: Promotion (Press the Attack, 1024). You may give Promotion to any of your Imperial Navy Officer units, and after another Imperial Navy unit is focused to strike, you can focus Promotion to have the striking unit gain the combat icons of the enhanced unit! 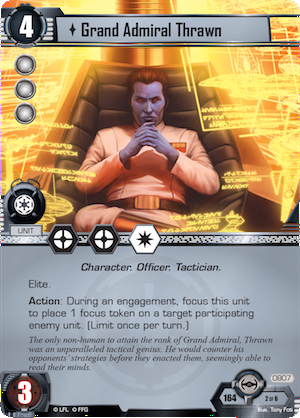 In other words, if you enhance Colonel Dyer or Grand Admiral Thrawn (Chain of Command, 807) with Promotion, you can take advantage of their powerful combat icons twice every round. You may even hold the threat of their combat icons over your opponent’s head, forcing him to account for them, then only triggering Promotion when it’s most effective for you. 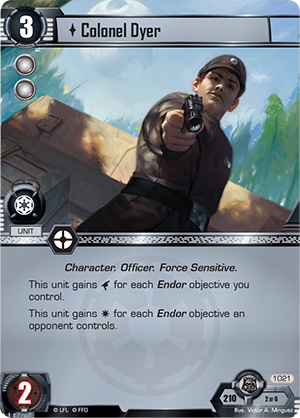 Ultimately, Promotion can greatly increase the threat of your units in combat, whether you’re attacking to claim more of Endor or defending the shield generator. The Rebels are preparing their strike teams to attack the Imperial shield generator, but with your troops and the might of the Imperial Navy at your back, you can withstand their assault. Take command of the greatest military power in the galaxy and look for Press the Attack at your local retailer in the first quarter of 2016!